*BY ORDERING ON OUR WEBSITE'S PAYMENT GATEWAY, MEANS YOU "The Customer" FULLY AGREE TO THE FOLLOWING TERMS AND POLICIES ON OUR WEBSITE. OUR PRODUCT - WHY MIXTAPEPLAQUES.COM & OUR METAL MUSIC AWARDS? Looking to celebrate your next big single, mixtape, albums, youtube or other streaming release? Looking for an affordable/fast turn around alternative to overpriced old school framed record plaques that need to be approved by a committee? Then MIXTAPE PLAQUES "METAL MUSIC AWARDS" are the AWARDS for you. We have sold and created over 10k "METAL MUSIC AWARDS" for Djs, Producers, Artist and Record Labels across the country every month. (See Our Client Gallery) Our product is so popular we have become #1 on GOOGLE for "RECORD PLAQUES", our "FULL METAL MUSIC AWARD" plaques are one of a kind, modern, affordable and fast way to celebrate your release or give as a gift without the need of any approval before you buy. Our Awards come in a number of huge sizes, which we then custom design with your name and artwork, then after approval we produce your award on a metallic press that prints and heats the design into the metal plate. We then add a floating mount to easily mount your new "METAL MUSIC AWARD" to your wall, office or studio. (special note: we do not sell riaa type glass framed awards, we only sell our original custom designed "Metal Music Awards"created on a solid metal plate and professonally packaged for delivery). The impressive size and the awards luminescent finish will look amazing on your wall and is a great promo piece on social media to impress your followers. 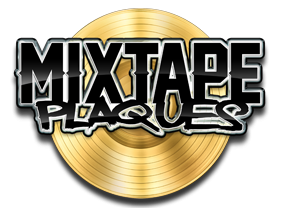 Order today for yourself, for your friend, for your next big award show and see why MIXTAPE PLAQUES is the #1 For New Modern Style Metal Music Award Plaques. Any questions please email us now before your order. We Are Not Responsible for Typos, Wrong Information or Any Design Flaws of Mixtape Plaque, Please Fully Review All Design Proofs Provided. As with All Personalized Products Created Just For You - Using Your Name, Text and Artwork to Produce Final Product : ALL SALES ARE FINAL, NO RETURNS OR REFUNDS ON PERSONALIZED PRODUCTS. THE PROCESS IS PERMANENT TO THE PRODUCT, SO THERE ARE NO REFUNDS OR RETURNS. The Buyer is Fully Responsible if You're are Not Available at the Address to Receive your Package, or Wrong Address and We Must Re-Ship, Buyer Must Pay for New Shipping Fees to Re-Ship. If The Package is Damaged Apon Arrival Please Contact the Shipping Company ASAP, then contact us. Checking Out and Paying Via our PayPal Gateway Means Your Understand and Fully Agree with Our Policies. U.S. SHIPPING ONLY - If agreement is made for international shipping, customer will have to pay for any additional shipping fees, taxes, custom fees and ect. Also International Shipping has no damage protection on metal music award and is at customers own risk. Notice: The Final Design and Product retains our copyright and trademark (MixtapePlaques.com), which customer understands we can use the final images on our website, to display order, and in promotions. Customer Images that feature our trademarked products can also be shared in the public domain and on social media, all customer agree to this by finalizing order. Unless customer does not own copyright image as covered below. *All cover images displayed on this website are provided by users/customers, if users does not own the copyright of the image we will remove asap from our website via DMCA LAWS (Contact Us). Mixtape Plaques and Company are Not Responsible for Third Party Provided Images to Produce their Order, We Do Not Verify Images Ownership, Third Party Customers are Fully Responsible & Liable of the Images and Content Sent to Use to Design and Produce their order. *All Logos and Brand Names are Property of the Rightful Owners, Only used here by Customers who use Such Services to Award Themselves. Mixtape Plaques does not verify accounts on such services or such customer stats, it at the liablity of the customer to provide truthful information.